The Federal Reserve Board on Thursday announced preliminary results indicating that the Reserve Banks provided for payments of approximately $65.4 billion of their estimated 2018 net income to the U.S. Treasury. The payments include two lump-sum payments totaling approximately $3.2 billion, necessary to reduce aggregate Reserve Bank capital surplus to $6.825 billion as required by the Bipartisan Budget Act of 2018 (Budget Act) and the Economic Growth, Regulatory Relief, and Consumer Protection Act (Economic Growth Act). The 2018 audited Reserve Bank financial statements are expected to be published in March and may include adjustments to these preliminary unaudited results. The Federal Reserve Banks' 2018 estimated net income of $63.1 billion represents a decrease of $17.6 billion from 2017, primarily attributable to an increase of $12.6 billion in interest expense associated with reserve balances held by depository institutions. Net income for 2018 was derived primarily from $112.3 billion in interest income on securities acquired through open market operations--U.S. Treasury securities, federal agency and government-sponsored enterprise (GSE) mortgage-backed securities, and GSE debt securities. The Federal Reserve Banks had interest expense of $38.5 billion primarily associated with reserve balances held by depository institutions, and incurred interest expense of $4.6 billion on securities sold under agreement to repurchase. Operating expenses of the Reserve Banks, net of amounts reimbursed by the U.S. Treasury and other entities for services the Reserve Banks provided as fiscal agents, totaled $4.3 billion in 2018. In addition, the Reserve Banks were assessed $849 million for the costs related to producing, issuing, and retiring currency, $838 million for Board expenditures, and $337 million to fund the operations of the Consumer Financial Protection Bureau. Additional earnings were derived from income from services of $444 million. Statutory dividends totaled $1 billion in 2018. 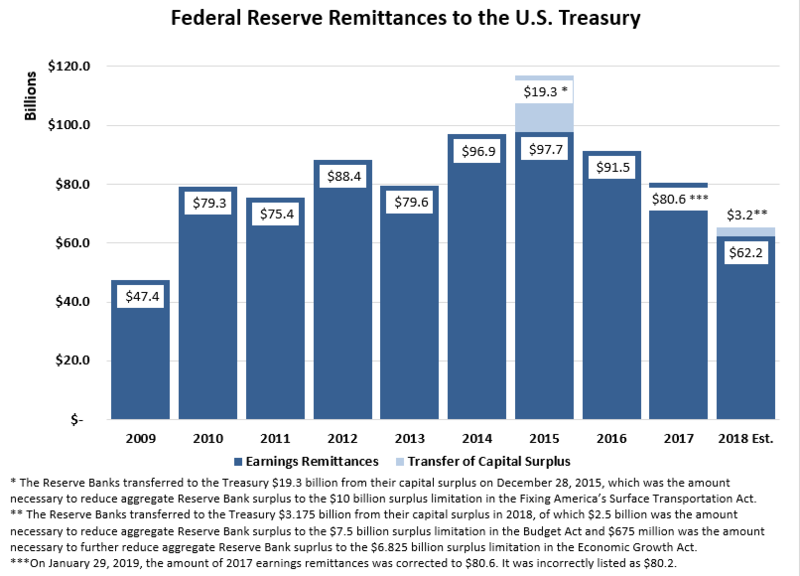 The attached chart illustrates the amount the Reserve Banks distributed to the U.S. Treasury from 2009 through 2018 (estimated).